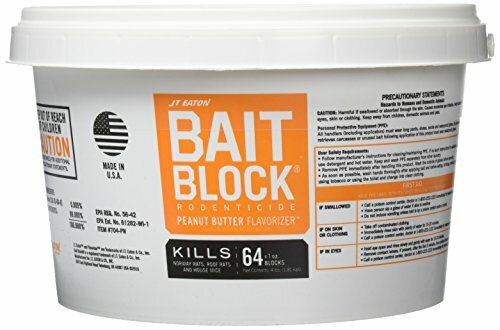 The JT Eaton Bait Block peanut butter flavor rodenticide is a first generation anticoagulant bait with specially formulated blocks that have a peanut butter flavor to attract and eliminate mice and rats. The active ingredient is Diphacinone 0.005-percent which efficiently eliminates smaller rodents and pests a few days after feeding. This product includes 64 blocks of 1-ounce rodenticide blocks in a tamper evident resealable pail. It is perfect for garages or basements to keep those rodents away. It. comes with a 1-year limited warranty to protect against defects in material and workmanship. JT Eaton's mission is to manufacture and distribute products designed to eradicate pests. We continually seek out new ways to provide consumers with the knowledge and products they need to create a healthier and safer world. JT Eaton has been family owned and operated since 1932 and they manufacture and sell only the highest quality products.